Art historian and artist Jeannene Przyblyski has been appointed as the new Dean of Academic Affairs at the San Francisco Art Institute (SFAI), replacing Okwui Enwezor who has been on leave from SFAI this summer working on a new book as a scholar in residence at the Getty. Enwezor will remain on the faculty of the school, working with the Museum and Exhibition Studies and History and Theory of Contemporary Art programs that he instigated at the school. Only one more week left to see Larry Rinder’s exhibition Galaxy at the Berkeley Art Museum, a potent curatorial statement that brings together works from the collection with several well-articulated strands of aesthetic interest. You have never seen the BAM permanent collection like this, and that is the magic of Rinder’s work here. 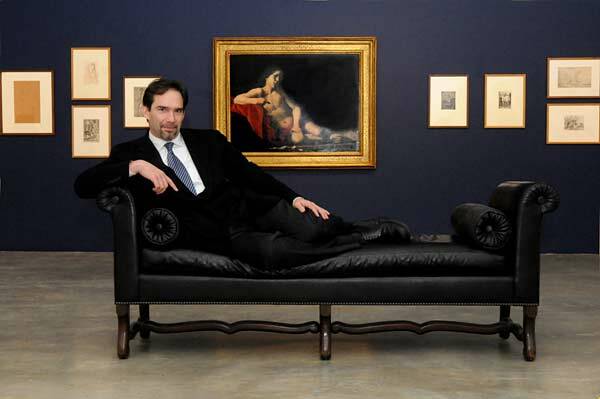 As Director of the Berkeley Art Museum and the Pacific Film Archive, doing this exhibition surely gave him a chance to get to know the collection even better than he already does and to make if his own. 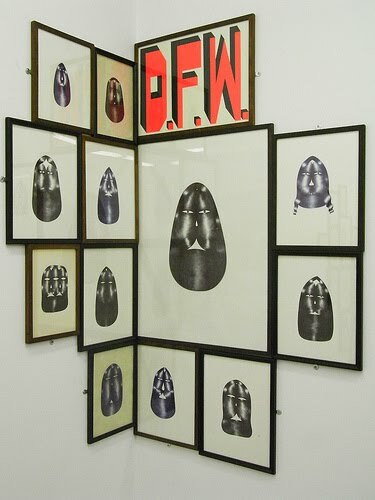 Artworks lovingly and assiduously ornamented with detail include European old master prints and modernist drawings, like the well chosen new acquisition by Barry McGee inscribed with very fine ballpoint pen and a fluorescent pink DFW. Down for Whatever are works evincing a cosmic view of multiplicity as in the night sky or in a swarming beehive convening with pieces that celebrate blue and black, like those by John Zurier, Sam Francis, Jay DeFeo, and Ara Peterson. Eroticism makes itself felt, with romantic pastorals and modernist works including a small realistic relief of a breast by Duchamp, and with horizontally framed endurance performance videos by Bruce Nauman, closeted up by the ceiling & hiding in the stairwell. The show is more deep and varied than even the love I felt for the pieces I’ve touched on above, and you can see some of this in a walk through video with Larry Rinder and with a piece by Johnny Ray Huston, another by Claudine Ise, and the piece on the Berkeleyan by Wendy Edelstein of Public Affairs, where I got the great photograph of Larry Rinder. At the Berkeley Art Museum through August 30, 2009. Climb down into the wonderfully creepy hole-like basement at Triple Base. 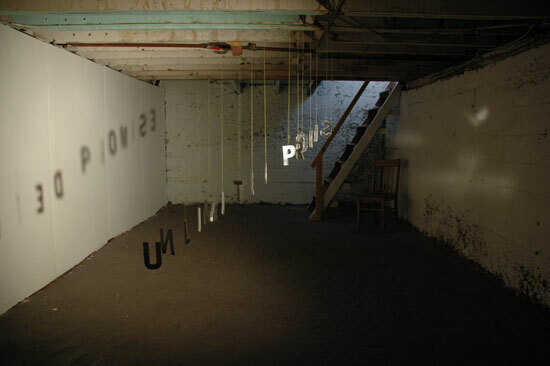 There in the dark you will find an installation by Christine Wong Yap that creates a palpably embodied visual and poetic experience. This contrasts nicely with the multiplicity of small 2D pieces and objects by several artists in the main gallery. Wong Yap’s work could be a comment on the genre of work in the show which is titled “Involved, Socially.” Together with the welcome mat by Amanda Curreri, reading “ME” one way, and “YOU” the other, the two works bookend the exhibition with a satisfying physicality. a new residency program at the ISCP in Brooklyn. Chosen from among past Artadia Awardees, San Francisco artist Josh Greene will be one of the first artists in residence. Watch and engage in the excellent ongoing comments posted on Julian Myer’s piece @ SFMOMA Open Space for developments in the effort to save and/or determine whether New Langton Arts can be snatched from the jaws of death. Those in the know appear to be holding cards close to the chest, while the community tries to understand the extent of the damage to the life system of arguably the most historically important alternative exhibition space in SF history.